While the cover is just gorgeous, All the Light We Cannot See is not a book I would normally pick up to read. It takes place during WWII. I have a very difficult time reading fact or fiction set during WWII. These awful events happened to real people. Men on the front lines. Jewish families in concentration camps. Boys pulled into the great war machine. Women and children whose towns have been occupied by the enemy. I get incredibly sad reading and thinking about what these people went through. 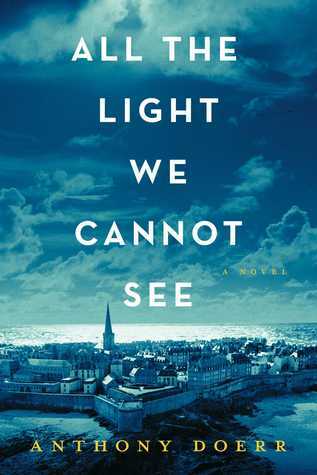 I decided to read All the Light We Cannot See to help meet my 2015 Reading Challenge, as this book is the 2015 Pulitzer Prize winner for Fiction. I’m glad I did. This review is going to contain a lot of quotes, simply because I found the writing to be so lovely. Frankly, my review is pretty bland in comparison to the haunting beauty of this novel. The story quickly switches back and forth between Marie-Laure, a blind French girl, and Werner, a German boy who is fascinated with science, especially the unseen radio waves. The air swarms with so much that is invisible! How he wishes he had eyes to see the ultraviolet, eyes to see the infrared, eyes to see radio waves crowding the darkening sky, flashing through the walls of the house. As we read the book, we realize that while Marie-Laure and Werner have never met, they have a deep connection through Marie-Laure’s dead grandfather. The bulk of the story leads us from 1934 to August 1944, when the Allies attack to liberate Saint-Malo, a walled city in northern France by the sea. Marie-Laure’s life begins in Paris, and we follow her and her father as they flee the city in 1940, when the Nazi’s occupy Paris. In a mining town in Germany, Werner is desperate to better himself, and ends up in an elite German military school for boys. We watch him as he goes along with the crowd, but he does struggle with things he sees. There are so many points throughout the book that deal with things unseen – light, radio waves, behaviors, even ghosts. The brain is locked in total darkness […] And yet the world it constructs in the mind is full of light. It brims with color and movement. So how, children, does the brain, which lives without a spark of light, build for us a world full of light? Now, I’m not good at finding what I call “deep meaning” in books. I am an unintentional surface reader for sure – it’s just my technological nature. But this book has so much going on below the surface. Even I caught glimpses as I read it. Beautiful metaphors. Mr. Doerr weaves his tale expertly, threading events and people and life together in a beautiful tapestry. This is a book about different kinds of bravery. Living a life in order to see what other people don’t. Understanding that when you blindly follow, you are living in darkness. You would like Frederick I think. He sees what other people don’t. Open your eyes to this book, and read what you’ve been missing. Beautiful review. I am a huge fan of books and fiction set in or inspired by WW1 and 2. I’m a huge history nut to be honest. And this book just sounds phenomenal, from all your quotes! It’s been on my TBR for too long. I’m so glad you enjoyed this, Kristi! I can’t wait to pick this one up myself! This book really was wonderful. I hope you like it Summer! I also read The Diary of a Young Girl in school too, so I definitely understand. In school we also watched The Devil’s Arithmetic which was a pretty gripping movie. I almost felt like a holocaust victim myself. Seeing the torture on major motion pictures makes it so vivid. And I haven’t heard of Schindler’s List but the wiki summary seems very intriguing. Also Steven Spielberg is great. I’ll definitely watch it when I have a free weekend or maybe winter break. Thanks for mentioning it! And awesome, I hope you enjoy if you get a chance! I was just telling my family that this is the one book in my 6 years as a bookseller has gotten rave reviews from everyone I have met. Customers are literally offering unsolicited glowing reviews of this book on a regular basis. It’s one of those books that seems to have transcended all reader types, ages, and preferences, which really impresses me. I have loaned my copy to my mother-in-law, but I plan to read it soon. I can’t pass up this book that has so many amazing reviews… yours included. I wasn’t sure what to expect going into it. He told a great story. Enjoy it! I’m thinking of using this as my entry too on my Reading Challenge. Books about history, world war, civil war, etc. usually catch my attention. I like how you brought a detailed review of this book without spoiling readers! Thanks for this! I would love to be a person who gets all the deeper meaning in books, but usually the author has to really hit me over the head. 😉 I was pretty good in this book, just one of those that is easier to “get” I guess. And you’re right – the characters in this book were fantastic! Very nice review — and I agree, a simply beautiful book! Awesome review. This book has been on my TBR list for so long. I hope I get a chance to read it soon.